A desire to make ethically grown, organic food from local farmers available to any household in Sydney has seen Julian Lee named the Sydney Social Entrepreneur of the Year. 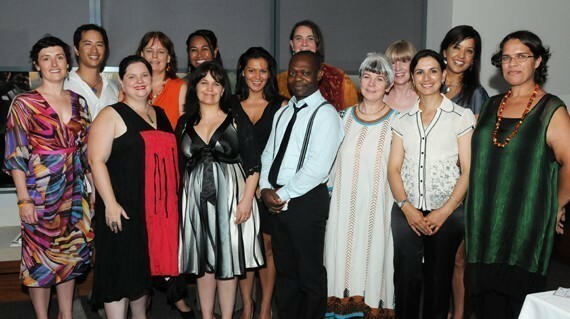 Above: 2010 Graduates from the Sydney School for Social Entrepreneurs. 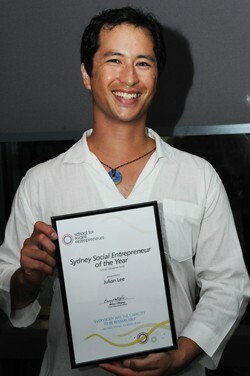 Lee received the accolade of Sydney Social Entrepreneur of the Year from the School for Social Entrepreneurs (SSE), as part of the School’s recent graduation ceremony. Julian Lee and 13 other students completed the School’s year-long personal and professional development program to help them grow their social businesses. Lee established Food Connect – Sydney’s first fair trade, organic fresh food delivery service – and he says the School for Social Entrepreneurs taught him valuable leadership and management skills, as well as connecting him with a supportive network of like minded people. The SSE says Lee represents a new breed of entrepreneur who is motivated by a community need rather than a desire to make money. Food Connect’s vision is to make ethically grown, organic and chemical-free food from local farmers accessible to any household in Sydney. Lee says Food Connect is committed to supporting local sustainable farming so they buy direct from farmers within an average of 250kms of Sydney and pay the farmers 40c in every dollar for the produce. Food Connect subscribers collect their fresh fruit and vegetable boxes from central drop-off points or “City Cousins” every week and Lee says these groups have become vibrant community hubs for swapping recipe ideas and education around good food. The School for Social Entrepreneurs says that since starting with the school in March 2010, Lee has made significant breakthroughs with the development of Food Connect Sydney. Lee says Food Connect Sydney started with around 20 subscribers early in 2010 and now has over 250 boxes being delivered every week to 34 City Cousins all across Sydney. Lee says Food Connect has donated over $1000 of fresh food to people in need through the Food Connect Foundation and is currently assisting relief efforts in Queensland where farmers have been badly affected by the floods. Lee praised the School for Social Entrepreneurs for providing personal and professional support through the development of Food Connect. He says not only has he been exposed to an inspiring and supportive network of like-minded people but he has gained valuable leadership and management skills as they have grown to a team of 12 permanent staff and 37 volunteers. The School for Social Entrepreneurs runs a 9-month program that gives social entrepreneurs the personal and business support they need to grow their venture to be more effective. Applications are open for the 2011 program commencing in July and bursaries are available to cover the costs of the program. For more information on the School visit ww.sse.org.au or on Food Connect http://sydney.foodconnect.com.au.